All background buildings in apartment, school, and Summer Town maps were redone with higher quality, better textures, and more detailed 3D models. New street signs and rooftop air conditioners. 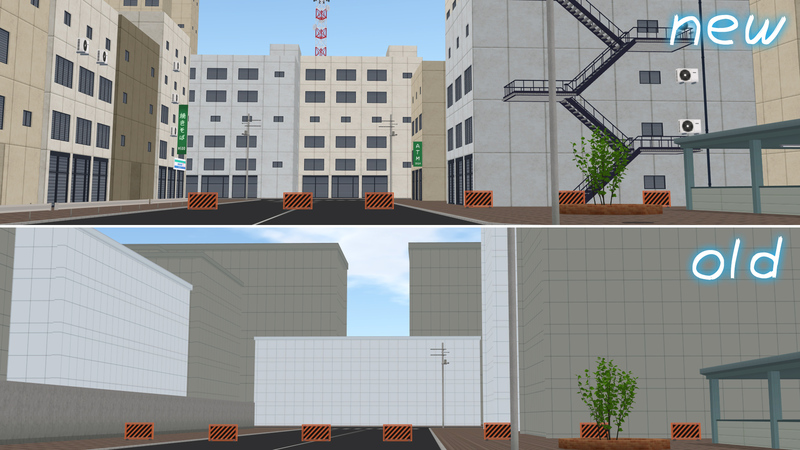 This is the third part of graphics updates (previous ones: 0.8.3 – new main buildings, 0.8.5 – new plants) done to get rid of all low-quality assets from early development stages of the game and bring all models and textures to consistent style and quality level. Fixed a bug with incorrect placement of objects in hands that happened if you swapped some items in “hand” slot. New stacked bracelet can be bought in the clothes store. Open her inventory (backpack button in the bottom-right corner) and drag & drop ice cream to her “hand” slot. How to eat strawberry ice cream? C’est quoi le prochain mise à jour de le jeu version Android ? Every time I install the demo of the game, at the moment of opening everything appears pink: the screen, the texts, etc. I love this game, and I want to play it, please help. You are probably using a very old computer. Maybe this problem can be fixed by updating your graphics card drivers. It’s coming in 1-2 months. Hello, can my girl friend be smaller than me? Or will she always be the same size? Her height is determined randomly when you start a new game. If you choose the smallest or the tallest height for your own character, girlfriend can’t be smaller or taller than you, respectively.